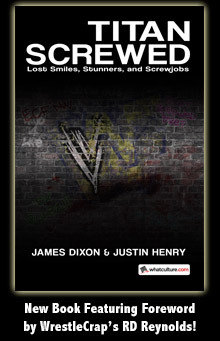 Re-Writing The Book: The (Unpublished) Novel, Part II - WrestleCrap - The Very Worst of Pro Wrestling! Night of Champions this year is announced to be championship matches only at the PPV. In under-card title news, The Usos emerge as no.1 contenders to the tag titles; Alberto Del Rio makes a run at Sheamus’ US title and Intercontinental Champion Wade Barrett faces a challenge from Dolph Ziggler, fresh off ending his feud with The Miz at Summerslam. The True Kings (Kofi Kingston and R-Truth) and Legally Strong (Mark Henry and David Otunga) begin to trade wins. Big On The Internet (Zack Ryder and The Great Khali) pick up an impressive string of wins elsewhere in the tag division. Ryback rebuilds from his first ever loss with a series of squash matches in which he looks desperate to recapture the unbeatable aura Tensai took from him at Summerslam. Whether he’s trying to make the fans or himself believe is up for debate. On a five-match card, everything gets a lot of time. Our first match of the night is a back and forth war between United States Champion (and WWE Title Money In The Bank Contract Holder) Sheamus and Alberto Del Rio, over Sheamus’ United States title. The story of the match is of Sheamus building momentum, being cut off by Del Rio, being worn down by Del Rio, making a comeback, getting cut off, getting worn down, and so on. Finally, Sheamus is able to plant Alberto Del Rio with a Brogue Kick for the three. Wade Barrett is on next, defending his intercontinental title against Dolph Ziggler. Ziggler has a lot of heat behind him coming off a career of great performances that has built steam after his lengthy battle with The Miz. Barrett, meanwhile, has stayed around the Intercontinental division almost since his debut. Barrett’s vicious strikes and Dolph’s tendency to bounce when hit makes for a great heel vs face battle, which sees Barrett hold onto his title after a Barrett Barrage. The smarmy, snarky, sneaky Rhodes Scholars are out next to defend their titles against the high flying team of The Usos in a traditional tag battle with hot tags, rising action, chaos towards its conclusion and new champions in the form of The Usos, ending the three month reign of The Rhodes Scholars. AJ Lee and Sara Del Rey are up next. Sara takes charge immediately, slamming AJ down and grounding her with submission locks, any time she escapes one, she finds herself locked into another. Finally, AJ is able to break out and hit a series of kicks culminating in an enzuigiri that staggers Del Rey, but is unable to drop her. AJ hits the ropes but is caught with a massive flapjack. Sara takes charge from here with suplexes, AJ managing to turn the tide when she dodges a forearm charge in the corner. AJ comes back with a flurry of strikes, a monkey flip, a running headscissors, a running neckbreaker, a leaping DDT. Riding high on the momentum, she lines Sara Del Rey up for a Shining Wizard and connects. Cover, one, two, kick out! AJ locks on an Octopus Stretch, but Sara is able to hoist her up into a powerbomb from this position, bridging it for two. AJ staggers to her feet and eats a nasty forearm that stuns her for the Royal Butterfly. Cover, one, two, three! New Diva’s Champion: Sara Del Rey! The main event tag bout follows, WWE Champion CM Punk and Seth Rollins facing World Heavyweight Champion Daniel Bryan and Roman Reigns. Punk, Rollins and Bryan do the heavy lifting, as one might expect, Roman mostly making quick tags to hit big, explosive moves, then tag back out. Bryan spends much of the match building heat to the hot tags to Roman, but his exhaustion from doing the heavy lifting results in being unable to help when Roman falls to a Go To Sleep. The rematch of AJ Lee and Sara Del Rey’s classic Night of Champions encounter starts off Hell In A Cell. It looks to be going much the same way as their last match, SDR confidently in charge, until AJ Lee is able to score a lucky roll-up for the three count. Furious, Sara takes the Diva’s title right from her hands and blasts her with it, placing it on the canvas and lifting AJ up, until Roman Reigns from ringside rolls in and forces her to back away from AJ Lee. Big Show and Dolph Ziggler go on next. Ziggler fights with fire, getting some incredibly hot streaks of offence on the much bigger man, until he leaps into a huge knockout punch for the three count. The tag title three way follows and is the quickest match to include The Great Khali you could ever imagine. Everyone gets their spots in in a battle that quickly breaks apart to chaos, ending when Sandow tosses Jimmy Uso to the outside, then Cody dives on him. Jey superkicks Sandow and dives out onto Cody. Khali brain chops a rising Sandow, then tags to Zack Ryder, who splashes off the top rope for a three count. For all of Cena’s flippancy when accused by Tensai, it is obviously important to him that he fight with honour. The two powerhouses fight back and forth with strikes and big moves, until Tensai is able to hit a choke-bomb on Cena for the three count. The still undefeated Lord Tensai hoists Cena up to his feet and offers him a handshake, respecting that he fought with honour. Cena refuses the handshake, instead bowing to Tensai. The Hell In A Cell match between Dean Ambrose and Chris Jericho comes next. This one is a vicious war, Ambrose targeting Jericho’s injured head, Jericho looking to injure Dean’s in return. The cell comes into play as a weapon early and often, and both men prove able to kick out of the other’s finisher, Jericho the first to kick out of The Human Cost. The finish to the battle comes when Ambrose hits a second Human Cost onto the ring steps for a three count. Sheamus and Wade Barrett work a super-stiff showdown of strikes and slams, the winner gaining the other’s title in addition to his own. Each kicks from the other’s finisher once during the battle, in addition to kicking out of White Noise, The Celtic Cross, The Winds of Change and The Wasteland and there are a couple of close double downs where the two fall from exhaustion after colliding on a clothesline or a superplex. “This is how much these titles mean to these men!” exclaims Cole, as the two exhaustedly trade huge right hands. Sheamus finally manages to hit another Brogue Kick for the three count and the two titles. The WWE title match follows, Punk paying from the off for enraging Orton, until Orton’s anger leaves him with some obvious openings to exploit, which allow Punk to turn the bout around and work Orton over with cheap shots and submissions. Punk brings Orton up for a Go To Sleep, but it is countered into an RKO for a two count. Orton is on the attack from here until Punk is able to yank the ref in the way of a clothesline, which brings Seth Rollins out, dashing to the ring and scoring a superkick immediately on Orton. Punk and Rollins start putting the boots to Orton, until Bryan comes out to tear into Seth and Punk, downing Punk with a leaping knee strike to the head. Bryan and Seth fight viciously and furiously, storming from the ring and quickly taking themselves out of the affair when Bryan turns a running powerbomb into the timekeeper’s area into a DDT, still taking the slam through the barrier, but making Seth take it too. Back in the ring, Punk and Orton go back and forth a little longer until Punk is able to hit a Go To Sleep for the three count to retain his title. Punk leaves the ring to yank Bryan up by the head and toss him into the guardrail, then into the ring. He helps Seth to the ring a lot more gently, then climbs in himself, only to eat an RKO. Seth rises and takes one too. Big Show makes his way down to the ring and beats on the tired Orton. Roman Reigns rushes the ring and scores a Superman Punch on Big Show, which staggers, but does not drop the big man. Roman hits the ropes again and Superman Punches Big Show over the top rope to the outside. Things break into a wild brawl, until the four men who are not involved in the match fight their way up the ramp and the Cell closes down on Seth and Bryan. Rollins rushes Bryan into the corner with shoulders, elbows and knees before dumping him to the outside. Waiting for Bryan to stand, Rollins then dropkicks him headfirst into the cell, grabs him by the head and tosses him into another side of the cell. Bryan sits against the cell and has his face turned to it by Rollins, who holds onto the mesh and lifts himself up so that he can press Bryan’s face into the cell with both feet. Rollins then pulls Bryan up and places him on the ring apron, holding his head against the ringpost to deliver a vicious knee to it. Rollins rolls into the ring and places Bryan’s throat against the second rope, standing on it to choke him, then backflipping off to pose for the crowd. Rollins plants Bryan with a suplex, then lines him up for a Curb Stomp. Bryan rolls out of the way, however, and manages to score a big flying knee for two. Bryan crouches over Rollins and hits a flurry of elbows to the head, before locking in a surfboard and raking the face, then jumping, bringing the knees crashing down. Elbow drop to the back of the knee follows, then Rollins is brought knee to ringpost, and Bryan runs across the apron to dropkick Rollins’ knee directly into the ringpost. Dragging him outside, Bryan hoists Rollins on his shoulder, knee pointed forwards and runs Rollins’ knee into the cell, before falling backwards in an elevated back suplex. Rollins stumbles away, but Bryan runs across the apron, dropkicking Rollins into the cell, then delivering knee after knee into Seth’s head, against the cell. Bryan picks Seth up by the head and tries for a hard irish whip into the ringpost, but Rollins reverses, sending Bryan right into the post. Rollins rolls Bryan back into the ring, then stands on the apron to hit a springboard clothesline for two. Rollins puts the boots into Bryan until Bryan is able to mount a comeback with a series of elbows to the ribs that stagger Rollins for a trilogy of lariats, sending Rollins rolling outside, where he takes a suicide dive. Both men down, they reach their feet to trade rights all around the ringside area, before moving back into the ring. Bryan German Suplexes Rollins, but Rollins lands on his feet behind Bryan. He turns Bryan around, kicks him in the gut and hoists him up for a powerbomb, only for Bryan to headscissors him, which Rollins rolls through into a roll-up, which Bryan rolls through for one of his own, only getting two. Still on his back, Rollins brings a swift kick to the side of Bryan’s head, then climbs the turnbuckles. Bryan stops him and climbs up behind, hitting a belly to back superplex. Bryan slow to make his way for the cover and Rollins is able to kick, then roll himself outside to catch his breath. Seth stunned on the outside, Bryan climbs the turnbuckles and waits for Rollins to stand. Once he does, he is immediately hit with a missile dropkick back into the cell. Seth begins to crawl away, but Bryan climbs the apron and again, as soon as Seth stands, he takes a running knee from the apron. Bryan tosses Seth back in the ring and hits a double underhook suplex, transitioning it into an arm bar. Seth comes back with a series of strikes, then hits the ropes, only for Bryan to counter with a spinning elbow. Both men lay down, exhausted, trying to catch their breath. The two slowly reach their feet and trade strikes. Seth dodges a second spinning elbow and lifts Bryan up in a back suplex position then plants him face first, then hits the ropes and comes back with a shooting star press for two. Amazed at the kick-out, Seth rolls outside and brings out the first table of the match, propping it between the apron and the cell. He comes back in, delivers some nasty kicks to the side of Bryan’s head, then whips him into the corner. A charging elbow strike follows, then Seth props Bryan on the turnbuckle, looking to superplex Bryan through the table. Bryan fights out, however, and manages to sunset flip powerbomb Seth back into the ring, Seth kicking at two and a half. Bryan grabs hold of Seth’s leg and locks in a nasty heel hook, Seth barely making it to the ropes, crawling under them to survive. Bryan goes for another suicide dive, but Seth springboards off the apron to catch Bryan with a knee to the head. Bryan tumbles outside and Seth grabs a chair, bringing it repeatedly across the back of Bryan, before tossing him into the ring. Seth looks at the chair, bent out of shape from punishing Bryan, and decides to toss a new one into the ring. Bryan is crawling away, but a running kick to the ribs stops that. Seth lays the chair down beneath Bryan’s head and hits the ropes for a Curb Stomp, but Bryan dodges. Both men returning to their feet, a kick to the ribs gives Bryan some distance. He lifts the chair and goes charging straight at Seth. Seth leaps over Bryan, who stops short and turns around just in time to be caught with a jumping kick to the head. Seth hoists Bryan up and delivers a running powerbomb to the outside, through the table set up earlier. Seth staggers away, then charges to the turnbuckle, leaping onto it and then sentonning to the outside in one fluid moment. Seth rolls Bryan back into the ring and covers for two. Seth can’t believe it and neither can the crowd. Bryan reaches his knees and is immediately caught with a superkick, again for two. Seth drags Bryan towards the centre of the ring and climbs slowly to the top to debut the Phoenix Splash for an amazed WWE audience. Bryan kicks at two and seven eighths and Seth grabs his head, unable to believe it. Almost on instinct, Bryan manages to roll Seth up for two, transitioning into a Yes-Lock. Seth reaches the ropes however and gradually pulls himself up, only to eat a double underhook superlex, Bryan holding onto one arm to lock the Yes-Lock back on. With nowhere to go, Seth taps in the middle of the ring. Daniel Bryan remains the World Heavyweight Champion. Another Survivor Series match is set for the big event, Jericho and Ambrose each captaining a team. Jericho manages to recruit Lord Tensai, Rey Mysterio and The Usos to help him against Ambrose. Tensai is the first to volunteer for Jericho’s squad, declaring Ambrose “A man without honour or sanity, hardly a man, an animal to be put down.” Mysterio and The Usos have both been victims of Ambrose’s insane, random violence in the past, and do not need much convincing either. Ambrose gets The Rhodes Scholars, The Miz and Alberto Del Rio. ADR is the first to join, explaining that he “admires Dean’s talent for hurting people.” The Rhodes Scholars join as soon as they learn that The Usos, who took their tag titles, are on the opposite side. The Miz joins because he’s scared of Ambrose. John Cena, citing his year of “put my legacy on the line against The Rock and fail, get attacked by Lesnar and lose, try to avenge Mick Foley’s victimisation at the hands of Dean Ambrose…and fail, fight Kane…and lose, fail to qualify for Money in the Bank, beat Lesnar! Yeah! But need to cheat in ways I swore I never would to do it, miss Night of Champions due to lack of title, get called on my cheating by Lord Tensai and lose” decides to take some time off to try and get his magic back. He really just doesn’t think he can face this year any more. Ryback and Kane open the show off, and Ryback gets some of his aura back in a one-sided demolition of the demon. Jericho’s team shows superior teamwork, which is not difficult as a dangerous psychopath proves a lesser leader than an experienced and likeable veteran. Ambrose’s idea of a tag match sees him blind tag, which is not so abnormal. More concerning is his habit of tagging out by slapping his partner across the face, unless he is tagging Del Rio, whose hand he shakes to bring him in. I guess the sadists have a mutual respect for each other. The Miz is the next elimination, causing Ambrose to lose his temper and run Miz headfirst into the barrier. Del Rio removes Jey Uso by countering a springboard clothesline with a superkick for three. Rey Mysterio puts Del Rio on the run and is about to hit a springboard move of his own, but Dean Ambrose has snuck up behind him, and pulls Rey’s legs out at the critical moment when he is standing on the ropes. Rey splats nastily onto the canvas, bouncing back from it. The ref pauses the match to check on Rey, and declares him unfit to continue. Del Rio, laughing, is rolled up by Jimmy Uso for two and a half. Del Rio gets hypocritically angry at the sneak attack and stays in, inflicting pain on Jimmy Uso until he manages to make the tag. “Coward!” declares Del Rio, as Tensai steps between the ropes. Del Rio, still full of pride and anger, stays in with Tensai when he really shouldn’t have. It doesn’t take long for Del Rio to fall to a choke bomb. Del Rio puts his hands up defensively as he moves around the outside near Ambrose, but Ambrose says “It’s okay, man, I get it, I do”. Ambrose and Cody find themselves wrestling a losing battle against superior numbers, which causes Ambrose to grab his briefcase while Cody is in the ring and just start blasting members of the other team, causing a DQ for himself. Cody, alone, does not last long before falling to a Code-Breaker. Team Jericho wins, with Jericho, Tensai and Jimmy Uso surviving. AJ Lee does better than she did the last time she was in the ring with Sara Del Rey. She never looks ready to put Del Rey away, but Sara Del Rey never looks like she’s having an easy time of it either. Regardless, Sara Del Rey regains her Diva’s title as the announcers wonder if this bodes ill for Bryan’s team in the main event. There is still a four way elimination tag bout to come before that, however. The tags are quick, the two men in the ring changing almost every minute. Mark Henry manages to get a big pop by lifting Khali up for a World’s Strongest Slam (earning its title being done on Khali) to earn the first fall and ensure new tag champions tonight. Henry similarly manages to remove The True Kings from the match by catching a leaping Kofi Kingston with a World’s Strongest Slam. A super hossy back end of the match follows, big heavy strikes and big heavy slams. Eventually, with Otunga out from a double suplex off the apron, Henry is staggered by a Barrett Barrage, which is then followed by a Brogue Kick, dropping the World’s Strongest Man for three. The Team Heyman (CM Punk, Brock Lesnar, Seth Rollins and The Big Show) vs Team Bryan (Daniel Bryan, Roman Reigns, Randy Orton and Dolph Ziggler) main event is next. The announcers who were worried that the SDR/AJ Lee match boded ill for Bryan’s team were right. The sheer power of Lesnar and Big Show combined with the sheer skill of Punk and Rollins is just too much to handle. The first elimination comes when Seth distracts Orton as Orton has Punk set up for the second rope DDT. Orton turns around to face Rollins, and while Orton is turned around and the ref is trying to get Rollins out of the ring, Punk low blows Orton and rolls him up for three. Bryan is able to even the odds, taking Seth out with a leaping knee strike. Roman is the next to be taken out, when Lesnar catches a Superman Punch into an F-5. Bryan falls next, to a Knockout Punch from The Big Show. Ziggler fights bravely, but falls to an F-5 as well. Team Heyman wins, with CM Punk, Brock Lesnar and The Big Show surviving. Celebrating one full year as WWE Champion, CM Punk introduces a new title belt to replace the old one. He is the title at this point, he reasons, and he can do what he pleases. The belt design is more old-school and does in fact, not spin. Ambrose’s behaviour at TLC has made him a lot of enemies, and John Laurinitis, fearing what a Dean Ambrose World Heavyweight Championship reign would look like, is quick to capitalise on this, making Dean defend his Money In The Bank Briefcase in a TLC match with The Miz (attacked by Dean Ambrose for being eliminated at Survivor Series), Rey Mysterio (injured by Dean Ambrose in same match), Cody Rhodes (abandoned by Ambrose in same match), Lord Tensai (considers Ambrose a man without sanity or honour, and therefore an animal to be put down) and Chris Jericho (hated Ambrose back in July, before it was cool.) Laurinitis doubled his own security before making this announcement. When asked about the match backstage, Dean grins “Life’s good: I’ve got a lot of enemies” before laughing and walking away, rubbing his hands together with glee. TLC opens with the tables match for the World Heavyweight Championship. The only thing bigger than Big Show is the disparity between Bryan’s skill and his. He is thoroughly and utterly outclassed in this battle, and him toppling through a table from a charging knee is only inevitable. Seth Rollins and Randy Orton sees Seth at his slimiest and cowardliest, and Orton at his angriest. The two go back and forth in an exciting battle where Seth takes every short-cut available and Orton takes every risk available, if it means hurting Rollins. The bout ends when Rollins is able to score a backslide off an RKO attempt for the three count. Seth immediately flees the ring. Sara Del Rey defends her Diva’s title against AJ Lee in the next match. Ditching the bodyguard and the skipping, AJ marches down to the ring with a deadly serious look on her face. Sara takes AJ lightly. This was not the smartest of moves. The match starts with AJ absolutely tearing into Del Rey, until SDR manages to get a boot up in the corner. Sara takes charge from here with nasty forearms, lariats and suplexes, until AJ counters a clothesline to the outside by pulling the rope down, sending Sara Del Rey toppling to the outside. AJ Lee hits a suicide dive, and then a running tornado DDT from the apron. She breaks the count, then rolls back out, trying to roll Sara back in. Sara reverses it, however, shoving AJ back first into the ring apron, causing obvious pain. Sara works the back from here and with such a strong and vicious opponent lasered in on a body part, AJ never really has a hope, failing to regain her title. AJ refuses help from the ref and the medical staff and makes her way slowly up the ramp, holding her back in agony. The TLC match for Dean Ambrose’s Money In The Bank Contract for a World Heavyweight Championship title shot is next and it is the spot fest you expect. Tensai chucks bodies around wildly, Dean looks for and often finds the best opportunities to hurt people, which has really been his M.O. since he got here, Jericho hunts vengeance on Ambrose, Rey flips around a lot, Cody falls off a lot of stuff and The Miz is…present, I guess? Despite everyone’s best efforts, Dean Ambrose retains his briefcase. Every single title belt, except Daniel Bryan’s World Heavyweight Championsip, Sara Del Rey’s Diva’s title and Wade Barrett’s half of the tag titles is at ringside for the next bout. Used to facing a more technical style of opponent in his run as champion, and with Sheamus pumped up on what he might be able to do tonight, Punk spends the early part of the match on the run, until he’s able to turn the tide with a cheap shot and then go to work on Sheamus, until Sheamus mounts a comeback. This pattern repeats again, but on the second big comeback, Punk is barely able to dodge a Brogue Kick. Seth Rollins comes running down to the ring, drawing Sheamus outside to beat him back. Staggering away from Sheamus, Rollins finds himself stumbling into an RKO on the ramp from Randy Orton, who has snuck up behind him. Sheamus turns and is caught with a suicide dive from Punk. Punk then tosses Sheamus back in and wears the Intercontinental, United States and Tag champion down with strikes and submissions, before locking on the Anaconda Vice. Sheamus will not tap, but cannot escape and finally passes out. 3 Responses to "Re-Writing The Book: The (Unpublished) Novel, Part II"
Is there gonna be a part 3? Can’t wait to read part 3.